The Helmet Heat ice reduction system by Gutter Helmet® is the ultimate solution to the problems caused by snow and ice build-up along your roofline and gutters. With Helmet Heat, you can say goodbye to frozen and sagging gutters when subzero temperatures and heavy snowfall come. At the heart of the Helmet Heat system is the heat cable with TPE (thermoplastic elastomer) over jacket. The cable’s irradiated conductive core increases its heat output as the temperature falls and decreases output as the temperature rises, making the system safe and energy-efficient. Since it is self-regulating, no monitoring is necessary. Helmet Heat cables cannot overheat and are GFCI protected. The system provides just enough heat to keep your gutters warm and melt the ice, but not enough to make the cables too hot to touch. They can maintain continuous temperatures of up to 150°F (65°C) for extended lengths of time through the winter as needed. The Helmet Heat system comes with two sturdy weatherproof control/ junction box options. Helmet Heat cables are installed underneath your Gutter Helmet gutter covers, giving you a clean roofline. Icicles are a safety hazard. The weight of accumulated snow and ice can also cause gutter hangers to fail and potentially injure homeowners or pedestrians. Ice build-up leads to costly water damage over time as the ice melts without proper drainage. 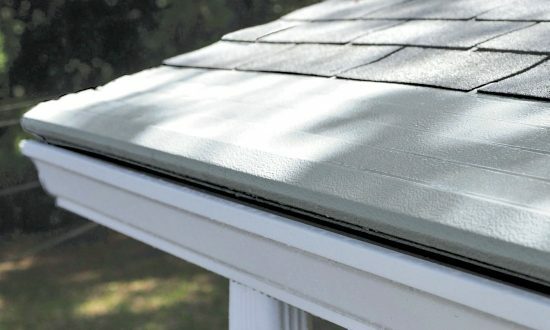 With Helmet Heat, snowmelt drains safely down your gutters. Frozen gutters can’t drain water effectively. Helmet Heat solves this problem and prevents your gutters from sagging from the weight of ice and snow. Helmet Heat should only be installed by trained and certified Gutter Helmet dealers. Talk to your local dealer today. You can also call (800) 824-3772 or fill out our online contact form to schedule an assessment, free of charge.